Eves24: Woo your Valentine with her "shining best friends". Woo your Valentine with her "shining best friends". Whose eyes you wish you could explain? Whose voice gave you butterflies? Whose smile made your heart skip a beat? And how being around them made you feel complete? If you answered with a “Yes” to all that, you are in love…. Love is that feeling that makes the world go round. And the confession of true love is something that can make a man go on his knees. A proposal is a prelude to all things beautiful that will follow, of sharing lives and dreams with someone special. So when you pick the perfect moment to ask her if she would spend her life with you, make sure you pick a ring that will make her want to say a YES even before you finish the question. True love is the biggest gift that you can give her, but our jewellery comes a close second. With help from our expert personal and corporate image consultant – Rashida Kapadia, we have created a collection inspired by the season of love, so we can be a part of your beautiful story too. Beautifully crafted honeycomb design adorned with a bright solitaire. 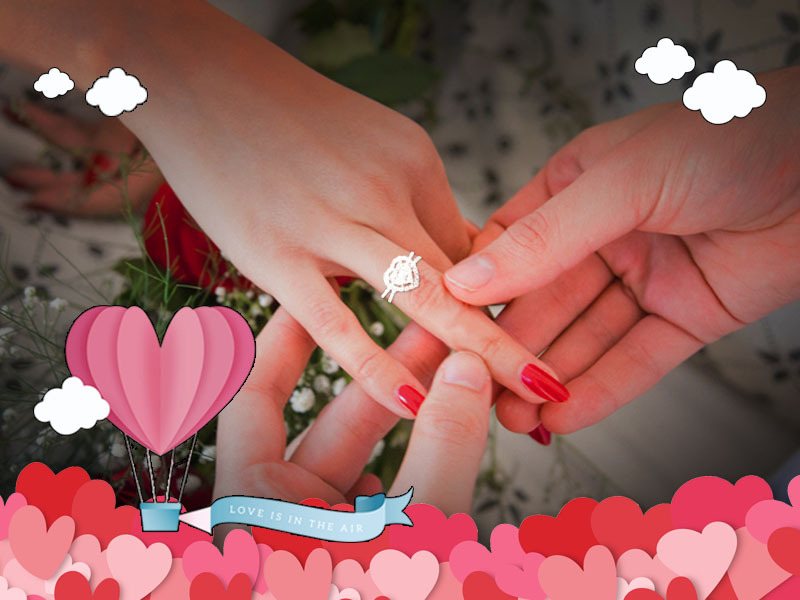 Celebrate your beautiful relationship and make a promise to always cherish the love you share. Make this Valentine's Day more memorable by surprising her with this beautifully crafted solitaire or a ring with a cluster of finely placed diamonds that looks just as dazzling as a solitaire and also takes care of your budget. The honey drop is great as an engagement or wedding ring. Suitable for all women and can be worn with any outfit. Brilliant solitaire set in the middle of an unending loop of smaller diamonds. Propose to her and seal you love with this sparkling rock. A message of commitment. Deliver this beautiful ring to her on a velvet heart surrounded by roses. The infinite promise is suitable for women with broad hands and fingers would look great with cocktail gowns and chiffon embroidered sarees. Similar designs with a cluster of fine diamonds in the place of a solitaire will be budget friendly and just as alluring! A beautiful tricolour spiral band ring dotted with beautiful marquise diamonds. 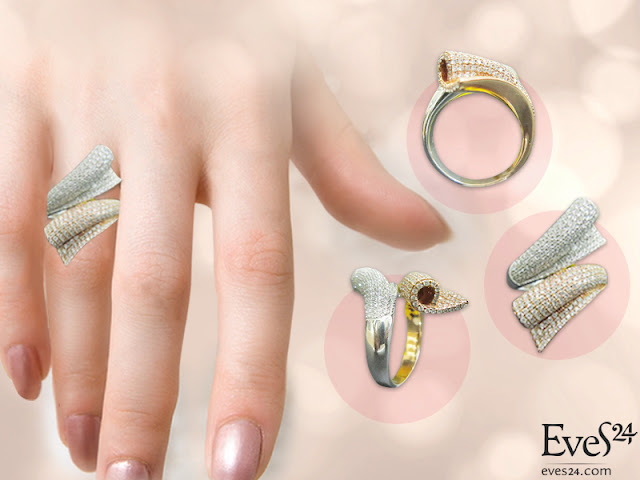 Gifting this stylish ring to your valentine would clearly show your taste and knowledge of trends. Spirally yours is a design that would look elegant, especially on long fingers and can be worn at brunches, kitties, etc. with indo-western outfits. A band of pear shaped diamonds bordered with smaller diamonds crafted in an intricate design. A band is a sign of eternal and everlasting love. This ring will speak a thousand words without you having to say a word. The perfect Valentine's Day gift. 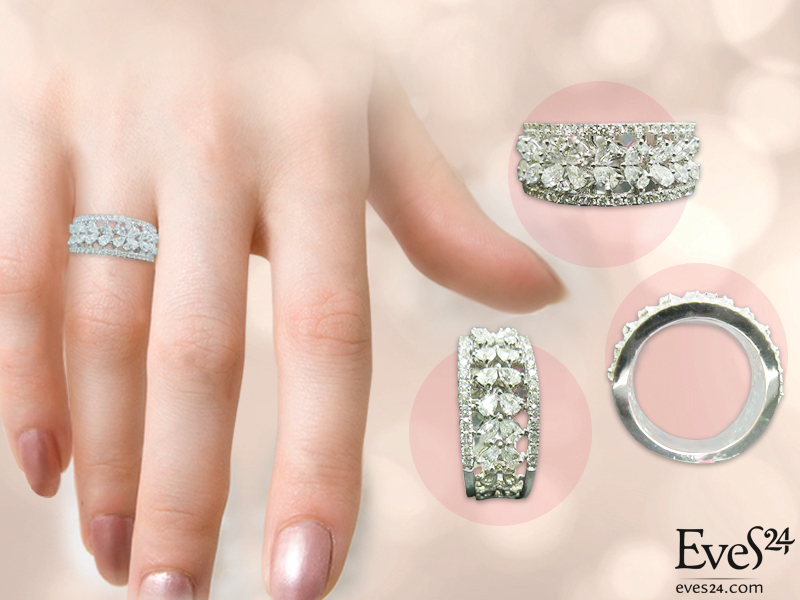 A classic piece of jewellery, the eternal band, will never go out of style. Can be worn as a permanent style statement which works with all types of outfits. Beautiful round diamonds tied together with a vine like ring band. 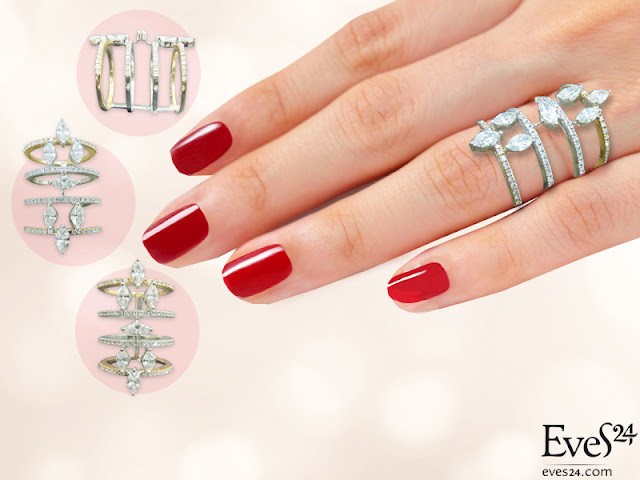 As sublime as love itself, this stunning rings is an epilogue of your love for her. Pear shaped diamonds form a dainty flower for her finger. Say it with flowers 'better still 'say it with a floral diamond ring' Add some more magic and whisper the three magical words to your Valentine. This pretty ring would look great on short as well as long fingers. Great for young ladies, they would look fabulous with formal outfits. A sparkling ring with diamonds set in white and rose gold. A glamorous cocktail ring in dual tones for the woman who balances her work and family life with complete harmony. A perfect Valentine's Day gift for the diva, and a perfect accessory with gowns or chiffon sarees. Rings have been synonymous to love and proposals for time unknown. But every love story is different. 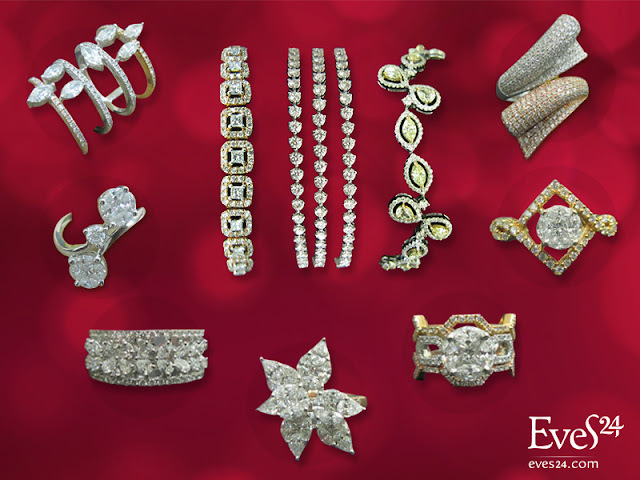 Maybe yours deserves an exquisite diamond bracelet. We have picked out some stunning pieces of jewellery for you to make her eyes sparkle with love for you. A touch of sophistication with this Valentine's Day gift, a beautiful geometric designer bracelet. A versatile accessory, it can be worn with silk saree or Anarkali or with a pretty summer dress for a luncheon date. A very thoughtful gift for your wife, this bracelet mimics a set of bangles that are an all-time status symbol and a classic. It can be worn as a single piece at an official meeting to show authority. They can be paired with a skirt, suit, churidars or saree. An ideal gift for your girlfriend or fiancée. A chic trendy style suitable for young ladies with a petite frame and slim wrists. Wear it with jeans and a ruffled blouse or with a sheath dress. 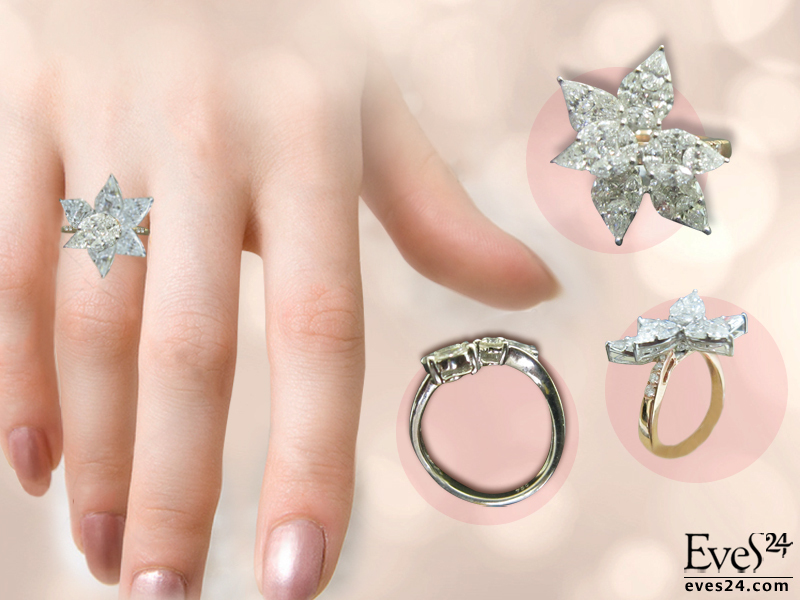 We hope our list of beauties inspires you to make your proposal as pretty as our jewellery. Come visit us at our designer jewellery studio in Bandra (West) or factory outlet in Andheri (East) to check out our collection and help us help you pick the perfect jewel for your jewel. At Eves24 we promise you the best in quality and designs. All our jewellery is 100% authentic, Hallmark and IGI certified crafted in beautiful designs. We offer a range of 20,000+ designs, so you can always be sure, there is something for you. In the rare case when none of our designs appeal to you, we can always customise & craft an exclusive ornament, just for you. Like / Follow us to stay updated on the latest designs & benefits you can avail when shopping for Diamond Jewellery.